The relationship between the Village of Rockcliffe Park and the City of Ottawa has often been a strained one. I recently explored the brou-ha-ha surrounding the renaming of Butternut Terrace to Acacia Avenue and the reaction of Charlotte Whitton to it. Though her outrage was largely symbolic, perhaps a symptom of an individual whose response knob to anything she disliked was always set to 11, the political and administrative rivalry between the two municipal bodies was quite real. It would not be unfair to point out that the (now former) boundary between Ottawa and Rockcliffe is not a natural one. To be certain, while the legacy of wildly different zoning regulations has rendered the difference between the two readily apparent, there exists no real natural boundary such as a river, valley, or unnatural one, like the Green Belt. The boundary existed running down the centre of a number of streets. Within the village, Rockcliffe was often characterized as something of a reluctant bride when threatened with amalgamation with the much larger City of Ottawa. A conception that was not entirely without merit – given the dramatic size difference. Of course, the picture painted by those boosting for Ottawa painted the village as a snooty, wealthy enclave on the same level of Westmount or Rosedale. This conception was also not without merit – given the relative financial health of the Villlage, value of real estate therein, and the powerful, wealthy, and influential individuals who called it home. Following Ottawa’s annexation of significant portions of Nepean and Gloucester Townships (notably including Manor Park and Westboro), it appears that the level of anxiety and conflict increased. Once again, it would be the roads – and the differing visions and needs on either side of the boundary – that would be the location of the kerfuffle. 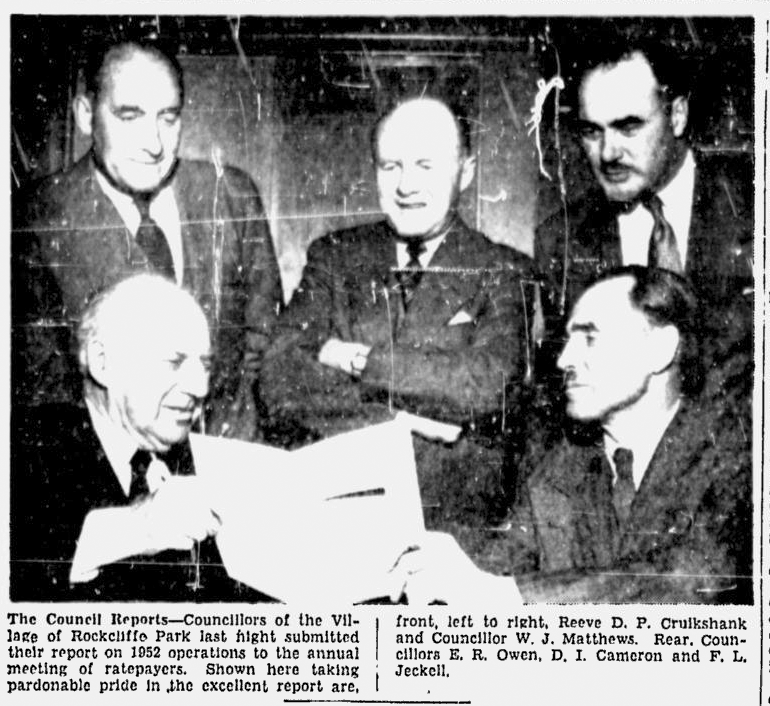 On May 1, 1953, the Citizen reported on Rockcliffe’s annual ratepayers’ meeting, at which then Clerk of the Privy Council, J.W. Pickersgill recommended that the “village should accept the city’s ‘most reasonable offer’ to rebuild Hemlock Road.”  Ottawa’s vision for it would be to lay a modern road with a concrete base topped with asphalt, the costs to be shared 50-50 with the Village. This would also match the similar improvements that were made to Hemlock between Birch and St. Laurent the previous year. For their own part, Rockcliffe Council rejected what they saw as an extravagant project because it was expensive and, after all, Ottawa required such luxurious roadways for its own Ottawa Transportation Commission buses. Since Rockcliffe neither had nor wanted public transportation, a simpler and cheaper roadway is all that was required. Clerk of the Privy Council or not, Pickersgill’s argument initially fell on deaf ears. 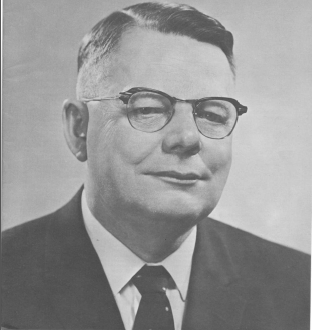 Pickersgill pointed out that Rockcliffe’s reluctance to cooperate not only opened them up to retaliation by Ottawa (“Rockcliffe could be made to contribute to the proposed new Sussex Street bridges which were used regularly by Rockcliffe residents”), but that the Province would also cover half of their share. Village council was nevertheless unimpressed by the argument and suggested that since the village paid the full cost of Princess and Lisgar Roads (neither of which fell in the village), that it should not be their responsibility. Nevertheless, it appears that the two municipalities were able to set aside their differences of opinion over the nature of the work to be done on Hemlock. At least, with some help from the Carleton County Council. The Board reports that after considerable negotiation with the Village of Rockcliffe Park it has received a letter from the Clerk advising that the Council of Rockcliffe has agreed to bear 50% of the cost of the heavy type pavements on boundary roads known as Birch Ave. and Hemlock Road and that a bylaw has been passed by the Village for submission to the Minister of Highways and the Ontario Municipal Board for approval. In addition Rockcliffe is making application to the Municipal Board for approval of this expenditure under Section 661 of the Ontario Municipal Board Act. Whether the amount sought will be affected by the reduction in the Provincial Road Subsidy grant remains to be seen as the City of Ottawa is also affected by the reduction of the subsidy grant in its road work, the Board has invited Rockcliffe to join with it in approaching the Ontario Government with respect to the grant. The Village of Rockcliffe Park was greatly assisted in arriving at its decision to co-operate with the City through the action of the County of Carleton Council in granting the Village a rebate of 75% of its payment to the County for road purposes. Upon the satisfactory conclusion of the aforementioned procedures, the Board of Control will take steps to secure tenders for these pavement works. Interestingly enough, the merger of cities has not put an end to such arguments. When looking at the comments section of any article that concerns the construction of new infrastructure, the claim that “it does not benefit my neighbourhood so I shouldn’t pay [as much]” invariably comes up. In some ways the machinations of intermunicipal relations have just been replaced with inter-neighbourhood relations that are acted on at the amalgamated city councils. The “nightmare” did eventually come true in 2001 following decades of whispers, proposals, studies, and threats from Queen’s Park. For some discussion from the Rockcliffe point of view (noting the “reluctant bride” theme), see Edmond, Martha (2005). Rockcliffe Park: A History of the Village. Ottawa: The Friends of the Village of Rockcliffe Park, Chapter 9, pp. 139-43.